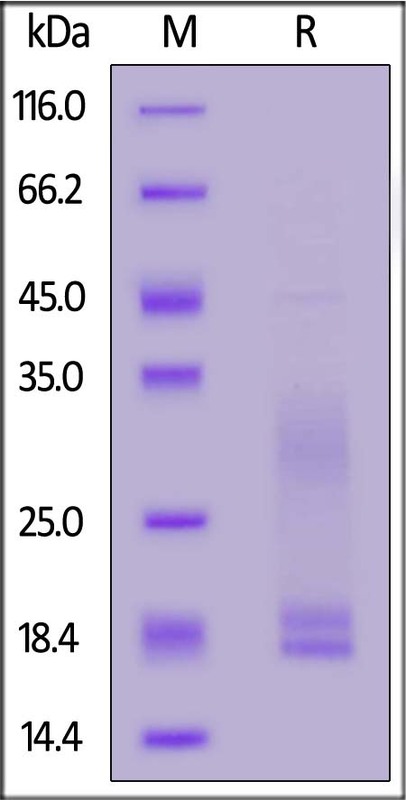 Recombinant Cynomolgus CD3E & CD3D heterodimer protein (Cynomolgus CD3E & CD3D heterodimer) Gln 22 - Asp 117 (CD3E,Q95LI5) & Phe 22 - Ala 105 (CD3D,Q95LI8) was produced in human 293 cells (HEK293) at ACROBiosystems. The heterodimer Cynomolgus CD3E & CD3D heterodimer is produced by co-expression of CD3E and CD3D, has a calculated MW of 15.5 kDa (CD3E) and 14.5 kDa (CD3D). Subunit CD3E is fused with his tag at the C-terminus and subunit CD3D is fused with flag tag at the C-terminus. The predicted N-terminus is Gln 22 (CD3E) and Phe 22 (CD3D). The reducing (R) heterodimer protein migrates as 19-22 kDa and 25-40 kDa due to glyosylation. Cynomolgus CD3E & CD3D, His Tag & Flag Tag on SDS-PAGE under reducing (R) condition. The gel was stained overnight with Coomassie Blue. The purity of the protein is greater than 92%. 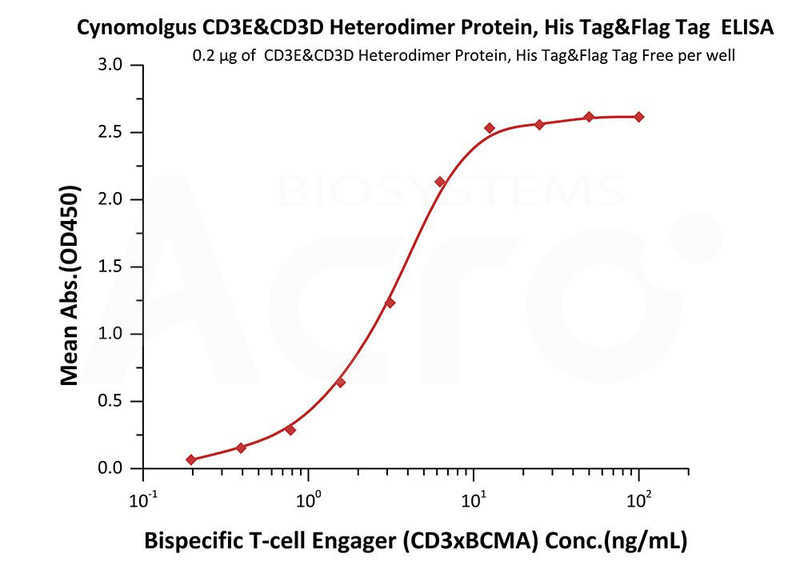 Immobilized SP34-2 at 5 μg/mL (100 μL/well) can bind Cynomolgus CD3E & CD3D, His Tag, Flag Tag (Cat. No. CDD-C52W4) with a linear range of 0.6-5 ng/mL (Routinely tested). T-cell surface glycoprotein CD3 delta & CD3 epsilon chain, also known as CD3D & CD3E or CD3D&CD3E respectively, are single-pass type I membrane proteins. CD3D, together with CD3- epsilon(CD3E) , CD3-gamma and CD3-zeta, and the T-cell receptor alpha/beta and gamma/delta heterodimers, forms the T cell receptor-CD3 complex. T cell receptor-CD3 complex plays an important role in coupling antigen recognition to several intracellular signal-transduction pathways. (3) Gil J, et al., 2011, J Clin Invest, 121(10):3872-6. (4) Lu X, et al.,2011, Hematology, 16(3):185-9.